A joint project of Bega Valley Shire Council and the community organisation, Clean Energy for Eternity, has been selected as a finalist in this year’s prestigious Green Globe Awards. Council’s Co-ordinator Environmental Management, Daniel Murphy, said the project, as one of Australia's first community solar farms, was both practical and aesthetic, creating a working solar farm generating electricity and an art installation. “The 30 kilowatts ground-mounted solar installation is arrayed to form the word 'IMAGINE' can be clearly seen from the air,” he said. 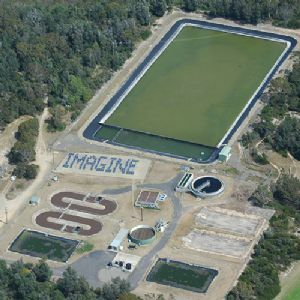 “The energy generated by the panels offsets electricity used by the Council-owned Tathra sewerage treatment plant and those savings are reinvested into a fund managed by CEFE for future community projects. Mr Murphy said the project partners were honoured that the project has been recognised for a Green Globe Award in the Climate change leadership category. “The NSW Government’s Green Globe Awards are the leading environmental recognition program, celebrating excellence, leadership and innovation in sustainability,” he said. The 2015 award finalists, across 16 award categories, were chosen by an independent panel of leading environmental experts in the fields of energy, water, waste, sustainability and environmental research and academia. Chair of the judging panel Robin Mellon said it was remarkable to see the sustained effort from not only NSW's largest corporates but also councils, small and medium businesses and community groups in the Green Globe Award nominations this year. The winners will be announced at the Green Globe Awards ceremony on Thursday 15 October at the Art Gallery of NSW, Sydney.